To support its activities, ICCBBA charges an annual licensing fee for the use of the ISBT 128 Standard. Primarily the annual licensing fee is based on the number of Donation Identification Numbers (DINs) assigned to collections by a facility in the previous year. For example, if a facility collected 15,000 whole blood units, ICCBBA would receive US $346.00. (This figure is based off ICCBBA's 2017 Fee Schedule). Click here for specifics regarding licensing fees. Click here for ICCBBA's Annual Reports to learn more about how licensing fees are used. ICCBBA expresses its deepest gratitude to all of our participating facilities/vendors, and to our team of volunteers, for their continuing support of the ISBT 128 Standard. For further information, see, "ICCBBA and ISBT 128 - Value for Money?" on page 13 of Blood and Transplant Matters (Spring 2010). 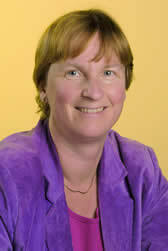 Ineke C.M. Slaper-Cortenbach is the Director of the Gene and Cell Therapy Facility and the Stem Cell Transplantation Laboratory at the University Medical Center Utrecht in the Netherlands. She has more than 20 years of experience as a laboratory director of a stem cell lab and is active in JACIE and AHCTA.